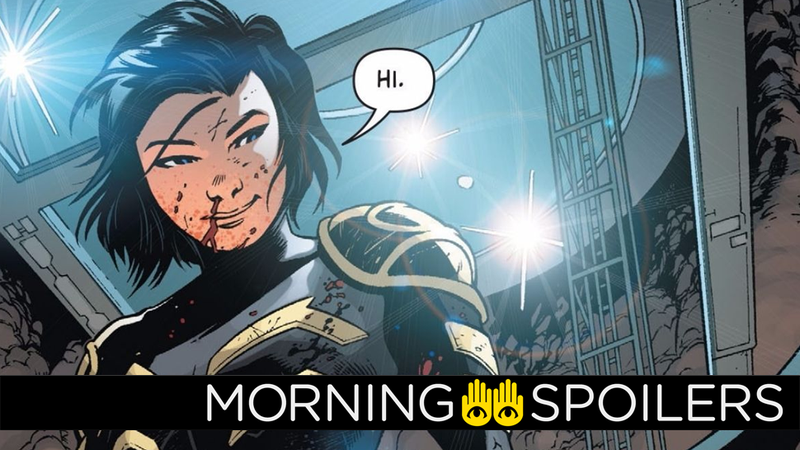 Variety reports that newcomer Ella Jay Basco has entered talks to play the film’s version of Cassandra Cain, a former assassin who eventually became part of the Batgirl legacy by donning the mantle—in the current comics, however, she operates under the codename “Orphan.” Black Canary and Huntress have already been cast. Deadline reports Tom Hanks will play the last man on Earth in Bios, a post-apocalyptic sci-fi film from director Miguel Sapochnik, producer Robert Zemeckis and Amblin Entertainment. Deadline also reports Bad Robot is now developing two horror projects, “a twist on a possession story” from screenwriter Blair Butler (Hell Fest) titled “The Steps,” and an untitled “female-driven horror allegory” from Megan Amram (The Good Place). Empire Magazine’s new “Empire Classics Alien Special” reveals the currently on-hold Alien: Awakening would have seen a return to the original film’s LV-426. Lin Manuel Miranda’s cockney accent continues to bewilder in the latest tease for the film. Deadline reports the CW is now developing “a musical comedy” series from Life Sentence creators Erin Cardillo and Richard Keith, “that reimagines the stories of four classic fairy tale princesses for today’s generation.” The show’s original music will be written by the songwriting duo, Alan Zachary and Michael Weiner. Oliver makes another life-changing decision in the synopsis for “The Slabside Redemption,” the seventh episode of season seven. Oliver (Stephen Amell) makes a choice that will affect his entire life, as well as the lives of everyone he cares about. James Bamford directed the episode written by Jill Blankenship & Rebecca Bellotto (#707). Original airdate 11/26/2018. While Nora (Jessica Parker Kennedy) grapples with unresolved anger over her father’s disappearance in the future, Barry (Grant Gustin) and Team Flash must stop a powerful new meta, Weather Witch (guest star Reina Hardesty), from killing her own father, Weather Wizard (guest star Liam Mcintyre). Sarah Boyd directed the episode written by Jonathan Butler & Gabriel Garza (#507). Original airdate 11/27/2018. James (Mehcad Brooks) falls in deeper with the Children of Liberty in his efforts to meet Agent Liberty (Sam Witwer). Meanwhile, Supergirl (Melissa Benoist) and Manchester Black (guest star David Ajala) follow a lead on Agent Liberty’s location, but things take a dark turn. Lena (Katie McGrath) kicks off her first set of trials. Chad Lowe directed the episode written by Dana Horgan & Katie Rose Rogers (#407). Original airdate 11/25/2018. The Winchesters team with Felicia Day to bag a human fly in pictures from tonight’s episode, “Optimism.” Head over to KSiteTV for more. Finally, Bane debuts in the latest trailer for Gotham’s final season.